"Life of the Party’s food carts always add a festival feel while providing fun, picnic snacks!". 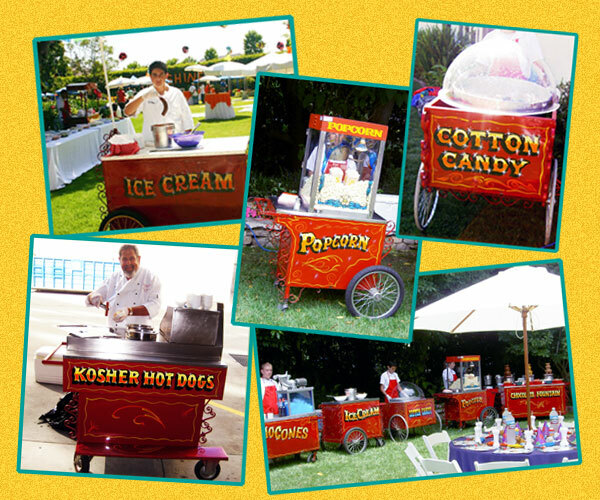 Our Food Carts are a FUN & WORRY-FREE way to serve your guests!! Delicious food prepared fresh at your event! Our head chef hand selects only the finest ingredients for your occasion. Our meats are fresh (never frozen), and only the highest quality produce is used for our recipes. All food is prepared and served on our old-fashioned carts. Includes all food preperation equipment, condements, eating utinsiles, paper ware, and EVERYTHINGE ELSE REQUIRED so that you can relax and enjoy. Great for parties, picnics, carnivals,outdoor (and larger, indoor venues), and any event where “FUN” is a priority! A HUGE variety of menu options are available! Click Here for a printable (PDF) menu!